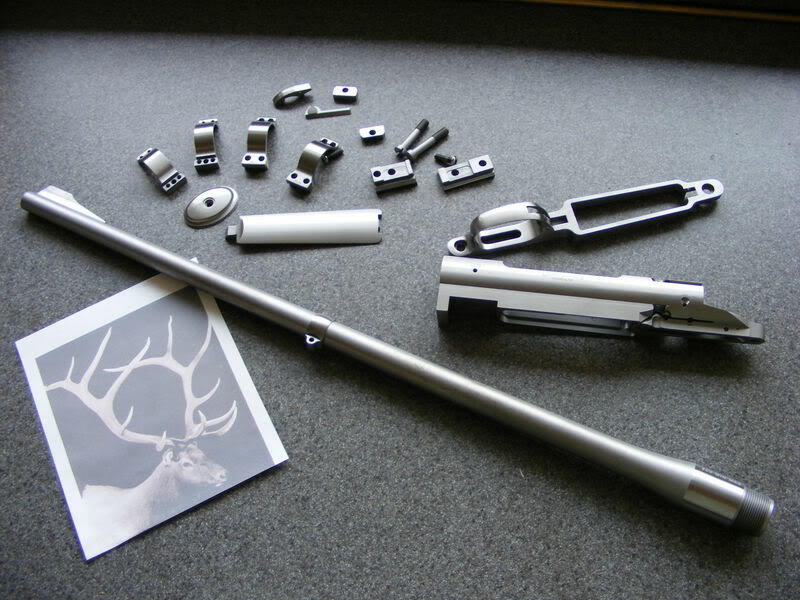 1 Here are the parts and a photo I took of a mounted Elk. 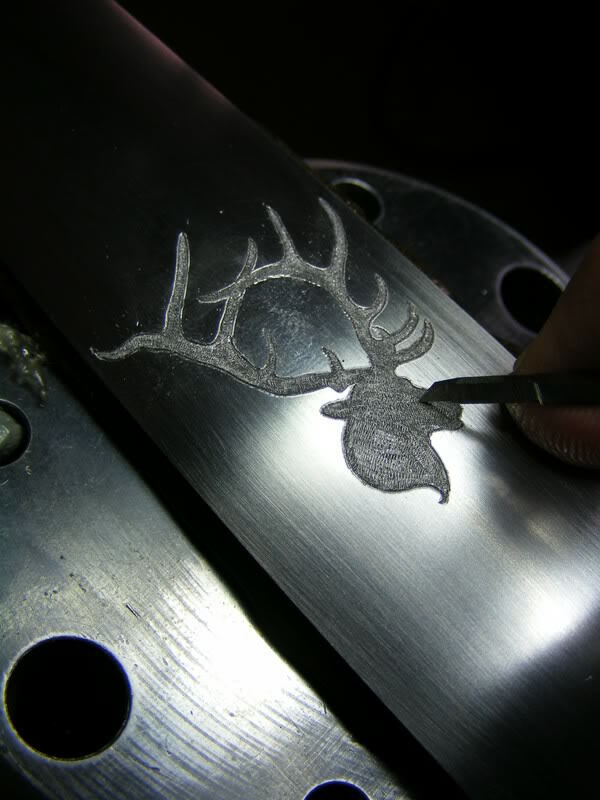 2 Next the Elk is scribed on with a pantograph, then modified for artistic merit with a scribe. 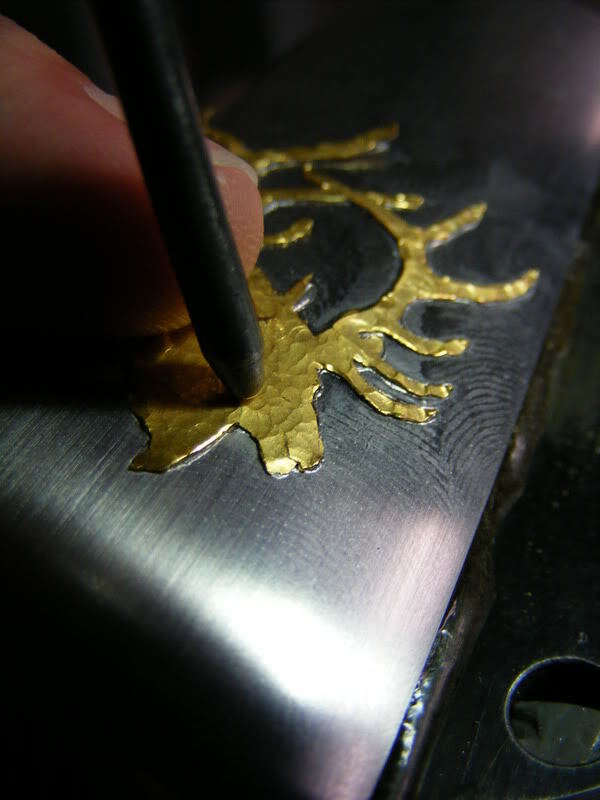 Then I cut the outline with the Lindsay Artisan handpiece. 3 Next I scanned the outline which I cut and put the floorplate and the printed scan on the Pantograph to get the ratios correct so I can scribe it as I cut it, onto the gold. 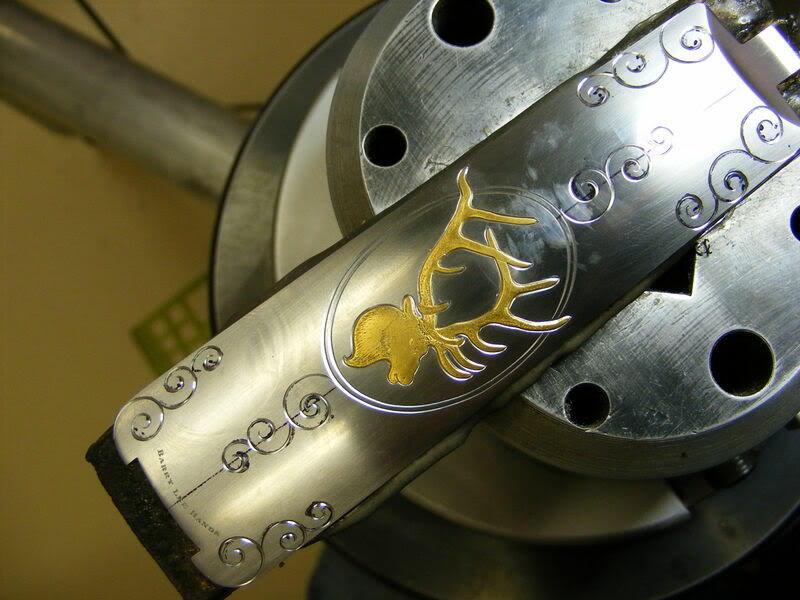 4 Then pantograph it on the 24k gold. 5 After that I cut a line around it to give the jewelers saw an easy path to follow. 6 Next saw it out. 7 ready to be damascened. 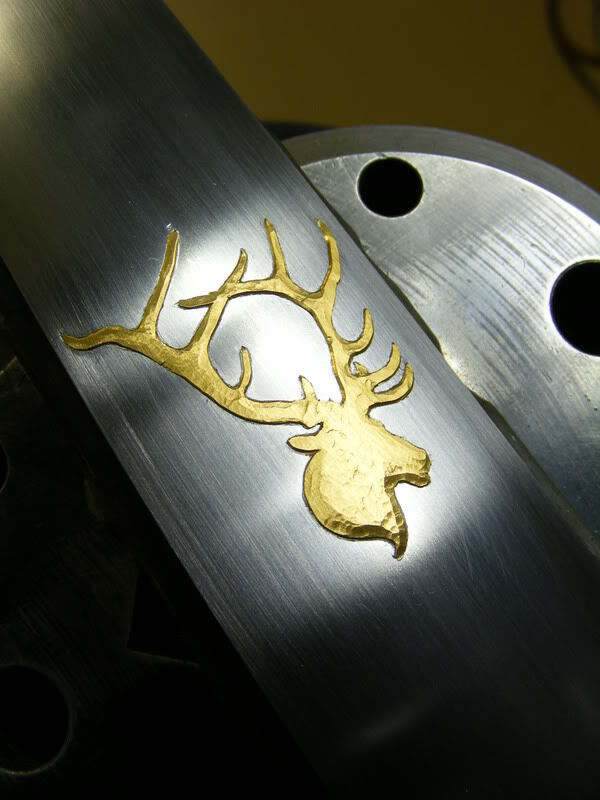 8 raising a burr field inside the outline of the Elk. 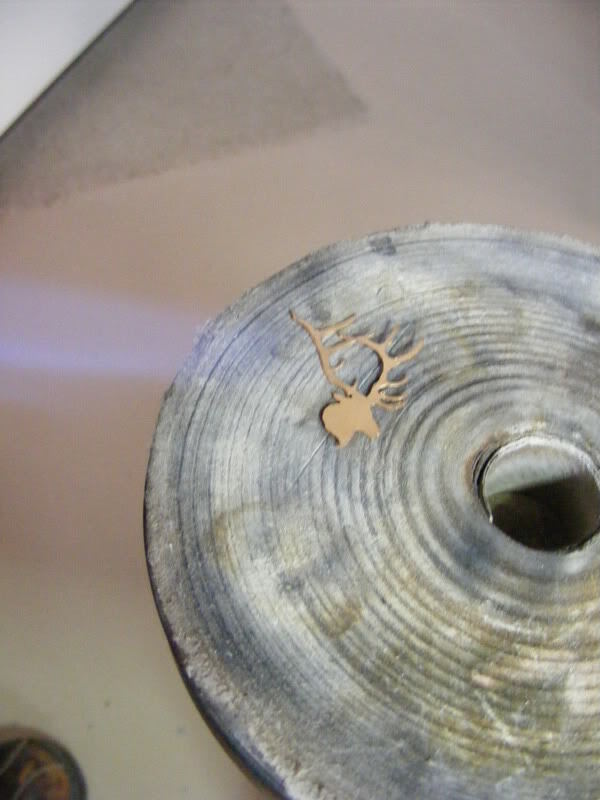 9 The gold is annealed. 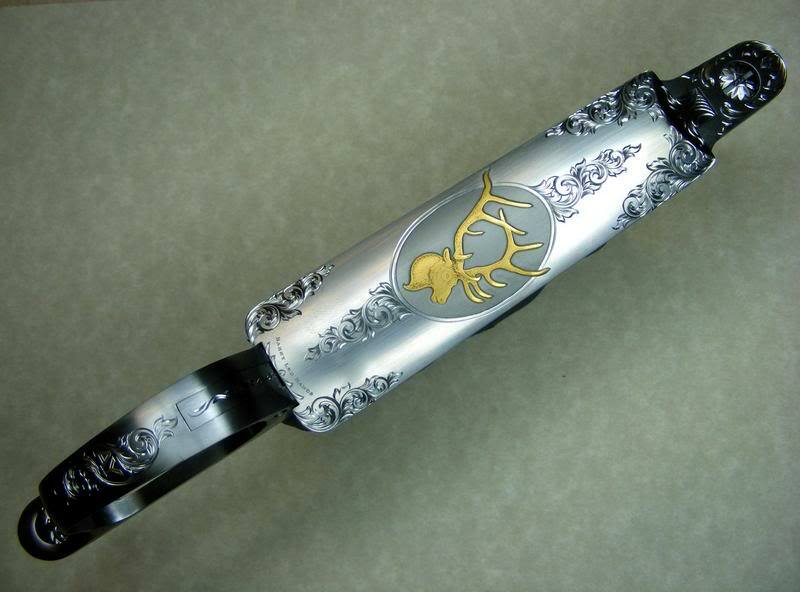 10 I punch the Elk down, started at the farthest points, the antler tips etc, and work my way in, hammering away. 11 all punched down, next it is sanded with 600 grit backed by a rubber block. 12 The Bulino is begun using a 70 degree tool with a lot of draft. 13 the scrolls are laid out. 14 the scrolls are cut. 16 The backgound behind the elk is blasted with aluminum oxide. 18 The finished floorplate and triggerguard. I really like your style of scroll. The tutorials are worth their weight in gold. Thanks for going to the trouble to document this project. Next time I ride up in your part of the country I gotta stop by for some pointers. 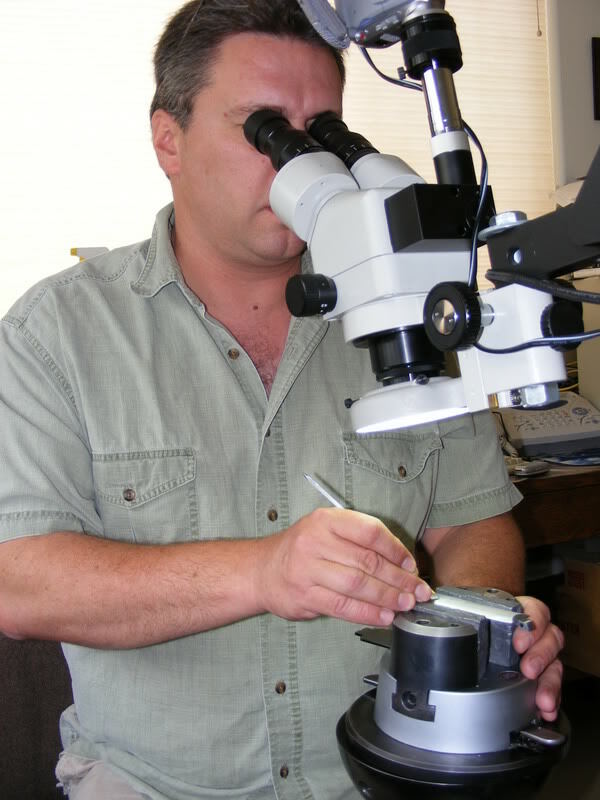 hi Barry and thanks for all of that info .. what are you using to hold the gold in place while you engrave it what is that gray material around the gold plate .... ron p.
Thanks Tim, D,Steve and Ron, the grey stuff is modeling clay, it holds it good enough to scribe the design on. Barry, thanks for showing your excellent works again. I really want to try.... (the lettering that you shown in your "Perazzi in Progress")but the gold is expensive, I have no idea what is the price, here in Hong Kong, a jewerlly tools supply can help to get some but their price are floating, I still not ready to give a try so I didn't ask them to quote the price. It seems too waste to use it for prastise, for those who are new to this kind of technique, what else material you suggest they use for practise before they use real gold on a real object? Or any other suggestion? Did you use gold for the first time you damascening? Just curious, will you collect the gold chips after engraving on gold? 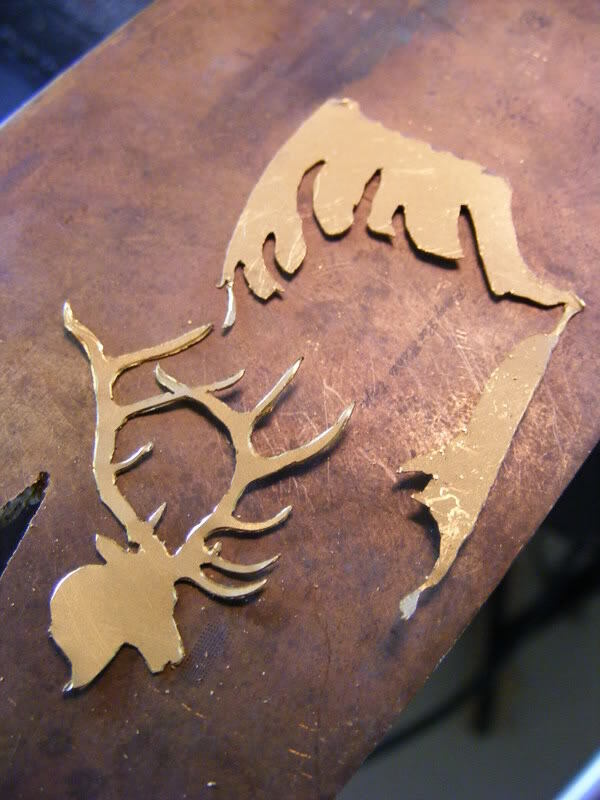 how you handle the left gold after you saw out the shape of the deer? metling it? Would you mind to tell what is the cost for the gold you used for the deer in this project so I can have a rough idea...? Do you need to stock different thinkness of gold for different project (please accept my apologize if the question is repeated as the forum's information is too massive and I still cannot read over them)? Pretty neat transfer method. Did you get that little tool from Lindsay? The gold in the Perrazzi is only $100 or so. It costs about $2 per inch for wire of that size, so it is very inexpensive. You can use copper for practice, from telephone wire, or fine silver 999fine, it is very soft and cheap. I have always used gold, I never really practiced much, just do it. I save the big pieces of gold scrap, the little pieces land on the floor and are thrown away, hehe. 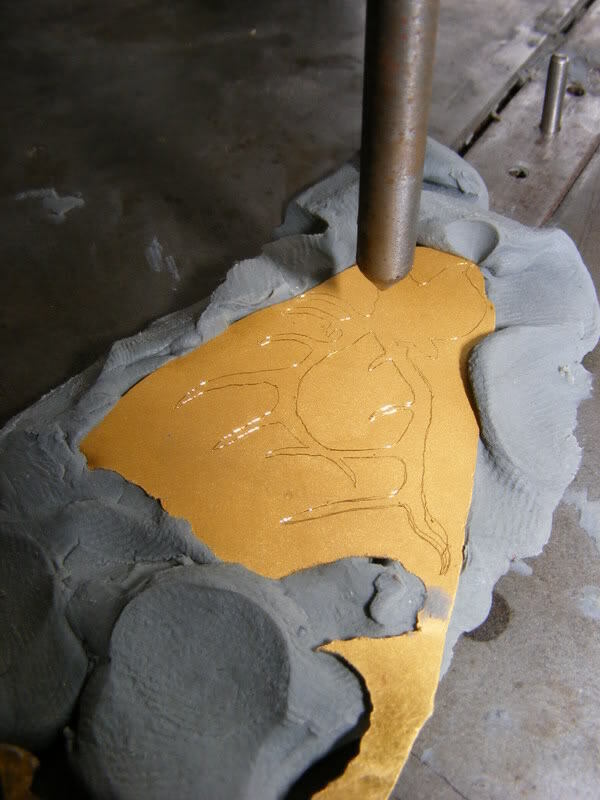 I remelt the large ones, small wire scraps, and roll them out with a mill to the thickness required. I never pull wire, I just buy it. 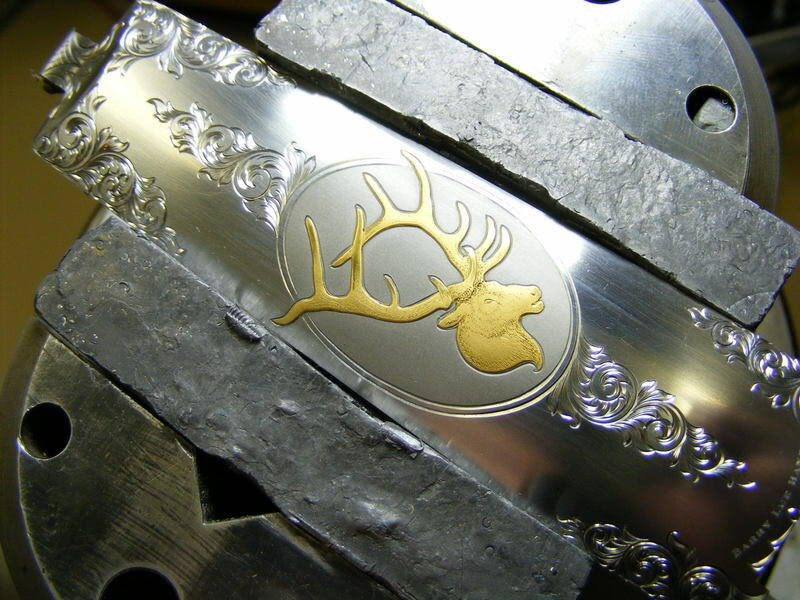 I would guess there might be $100 dollars of raw gold in the Elk at the very most. The value is in the work. 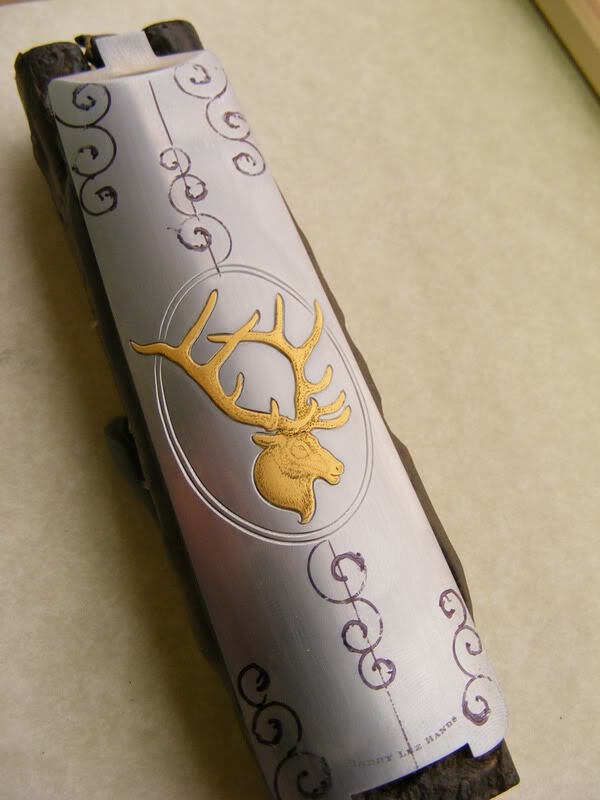 Barry that is stunning work and thanks for sharing the method of transfer and the inlay. Barry, I have been trying your damascening and am not having any success. 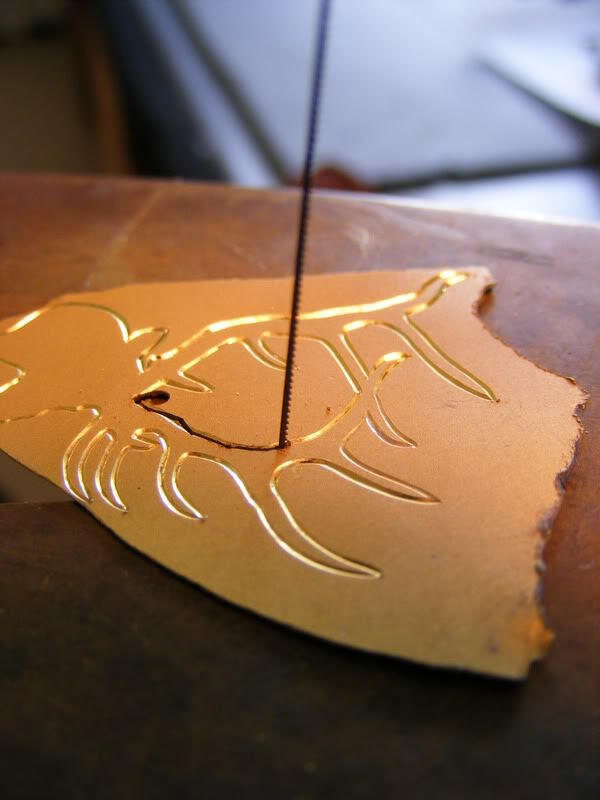 I am using copper and brass, I anneal them before I try to place them. I am undercutting the circumfrence, I am cross hatching with a flat with 45 degree face and no heel. I can and do inlay with 30 thou material but this 10 thou is causing me fits. I could be cutting my outline too deep. Also what saw blade are you using in your jewelers saw. I have no. 3 and it hasn't enough teeth per inch to cut the 10 thou material smoothly. A tutorial with great clarity. Thank you for the time and careful preparation it takes to generously post this for us. Neil, you cant do this very well with brass, and copper is not as easy as gold, and in damascening, the thinner and flatter, the better. I dont know what saw blades I use but they are vey fine. 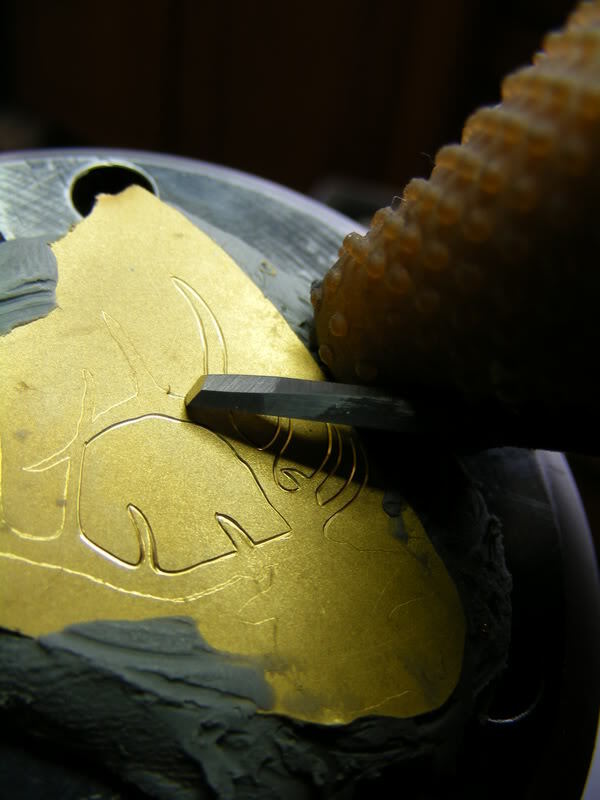 Jroettger, the raised relief is the thickness of the gold, the burr field is very fine in damascene. Thanks guys. . . .
thanks Barry, I guess I will just have to bite the bullet and use some gold. unless some silver will work? Thanks for the reply Mr. Hands. How do you mask the gold elk when blasting the background???? I think I blasted the Elk also, but if I masked it, I used packing tape. Just wanted to say that the tutorial as well as the work was done bueatifully, and a lot of information. 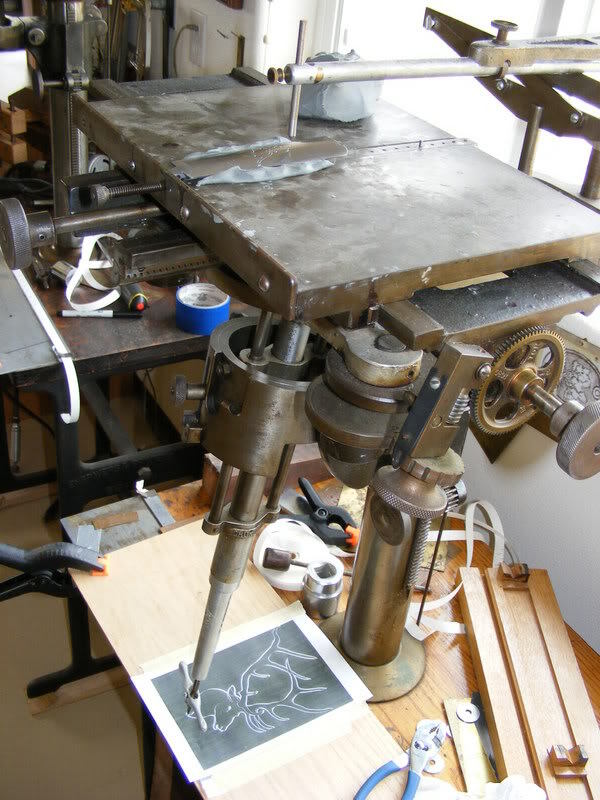 Barry what kind of pantograph would you recommend for this process? I would assume it would need to have a sensitive touch. The hermes pantograph for lettering in my opinion is too heavy for scaling unless you have a template? I use a cronite universal, but you can get along by doing acetone transfers, I do them quite often also. What is the thickness of the gold? and where did you purchase the gold? 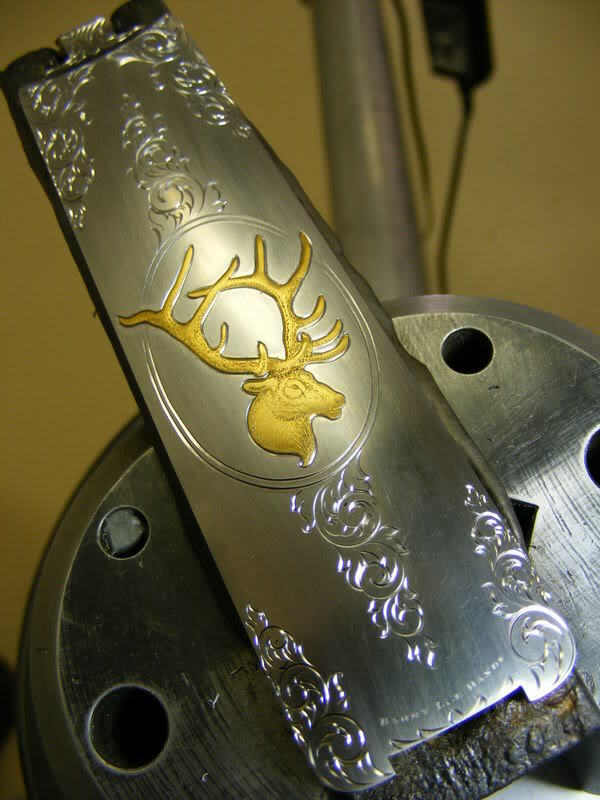 I bought that gold in the form of a canadian maple leaf, and rolled it out with a rolling mill. You can get whatever you like from Hoover and Strong. Really nice, i like it. The black in the carved parts, how is that done!? Barry, Thank you for sharing your knowledge and methods as you do. 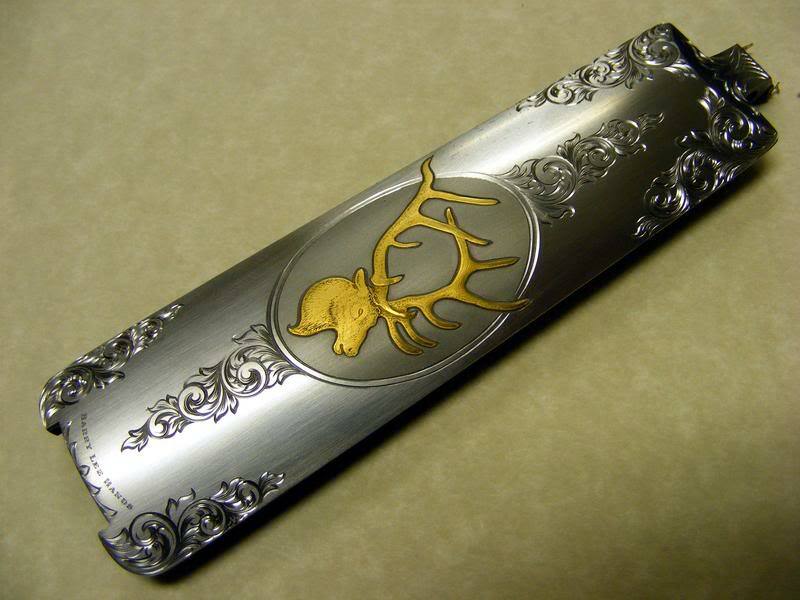 I've been a serious student of engraving for a couple of years now. Tried in the 70's but info was scant. 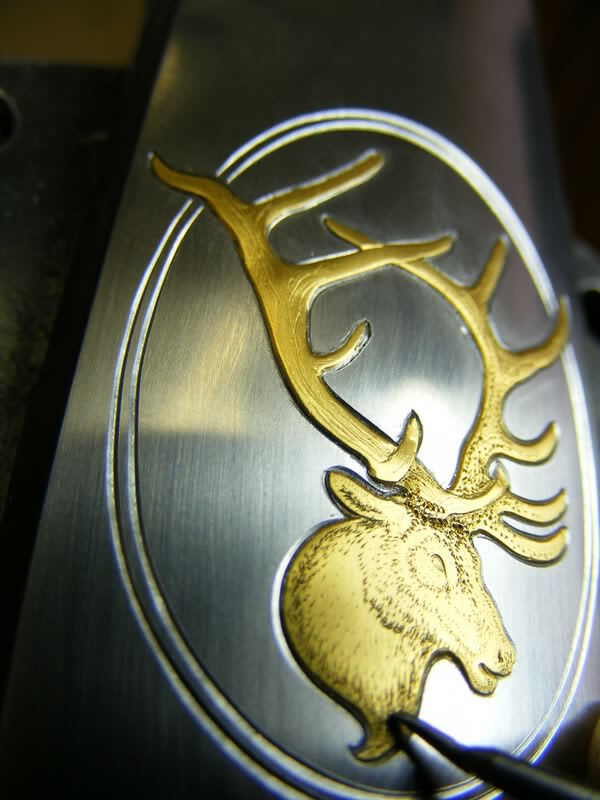 I'm currently cutting my first pistol, a Ruger Bisley in stainless(damn that loading gate!) I'm doing hammer and chisel with carbalt tools. I have learned more cutting this gun than all the previous cutting I've done! Before starting this gun I may have had a shot at heaven,now maybe not! Thanks again for the info and inspiration. beautiful work as usual, thank you Barry for showing us your techniques, it really helps us become more knowledgeable and informed of the different techniques available.